When your company's most popular t-shirt says "You will do better in Toledo," you're bound to hear a joke or two if your company is not actually located in the city. Just ask John Amato, whose screen printing business Jūpmode is moving from Perrysburg to downtown Toledo this summer. "It's important for us to put into action ‘You will do better in Toledo,'" he says. "We've always felt like we're a part of the Toledo community, and now we will be in location as well." The move means more space (from 1,500 square feet to 13,000 square feet), the opportunity to add more services, a separate production area, offices and a retail shop. It also means buying and investing in a building on Adams Street. "For a business like ours to grow in the way we have — to be able to move into downtown Toledo and actually buy the building and secure our future this way — is an opportunity that is unique to Toledo, and we recognize that," Amato says. Amato, who never expected to get into the t-shirt business, started Jūpmode in 2006 after watching an Ohio State University football game. 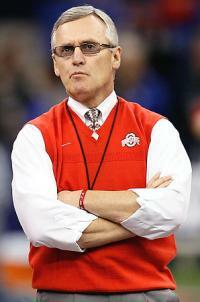 He had the idea that someone should make a sweater vest t-shirt similar to then-head coach Jim Tressel's trademark outfit. Amato's dad challenged him to do it, so he did, and a business was formed. Perrysburg was a perfect fit for the just-starting business, and it made sense for Amato because Perrysburg is his hometown. He attended Central Catholic High School in Toledo and went on to the University of Notre Dame for college. He came back to Toledo after an internship in Paris in order to start a business and be closer to his family. Although Jūpmode is well-known for their Toledo City Pride line of shirts, most of their business comes from custom screen printing. They print custom shirts for businesses, schools, churches, events, and other local organizations. The first shirts were printed in Mexico and overseas, but now Jūpmode does their own screen printing, and it's helped the business grow. "It was really a natural extension once we had our own equipment — people had been requesting it from us," Amato says. "It was difficult for us to contract that out and provide the service that we wanted." Amato is certain business will continue growing after Jūpmode is in their new location, thanks to new equipment and a focus on expanding their promotional products and embroidery services. Those things will bring in new customers who have needs beyond screen printing, Amato says. Growing a business is good, but it's not always easy. "The biggest challenge we face is growing but maintaining who we are as a business," Amato says. "We have ambitious growth goals, but it's important for us to maintain a personal connection with the community while we do that. We want people to understand that if they want shirts made they can talk to somebody rather than send an email, they can stop in and see our shop and view the process." Jūpmode has an active social media presence that brings in customers, Amato says. Referrals are another source of new customers, as are local businesses that want to work with other local businesses. Amato thinks local pride plays into some of Jūpmode's business, too. "I think people are looking for ways to support local businesses. They're going out of their way to support local restaurants and bars, they're going out of their way to use local companies for whatever need they may have, and screen printing's no different," he says. Amato didn't have a specific location in mind when he was figuring out where to relocate Jūpmode but says the Lucas County Land Bank was a great help in the process. Through them, Jūpmode was able to buy a county-owned building, as well as become a more data-driven company. Amato is excited for the move and the new opportunities his business will have. "If it looks fun, then it probably is," proclaims Jūpmode's website. Amato thinks screen printing is pretty entertaining, but he's serious about the business side of things, too. Jūpmode has added six employees in the last three years, and Amato hopes to add more after the business moves into a bigger space. He focuses on giving employees fair pay, benefits and a place where they actually want to work. "The most important thing is that we provide a work environment that our employees really enjoy," Amato says. "That reflects to our customers, the general public, that's the most important thing that we can do." What started as a business with one t-shirt has turned into something much more, thanks to Toledo's residents and local businesses. Jūpmode's t-shirts and other products are available online, in local stores like The Art Supply Depo and Handmade Toledo and in Kroger Marketplace stores in Perrysburg and Sandusky. "We're telling people that you will do better in Toledo," he says, "and for us that's true, because we've seen the support the community's provided us in growing from, essentially a small start-up, to who we are today." Elizabeth Xu is an Ohio-based freelance writer and happy to call Toledo home. Follow her on Twitter @ElizabethMXu or visit her website: www.elizabethxu.net.